Teddy-bear like goldendoodles have impossibly cute coats that need to be brushed and groomed properly. This adorable dog breed is a crossbreed. And as a result, their coats can vary between individuals. Dog owners should therefore carefully choose grooming equipment like brushes to keep their pets’ coats healthy. Goldendoodles are famous for being a “hypoallergenic” dog breed that doesn’t require major upkeep. This is only partially true. Crossbreeds like goldendoodles don’t have a fixed coat type. However, in general terms, this breed is known to have slightly curly but shaggy coats. Goldendoodles are not as curly as their parent breed poodles, but do have coats that are fluffier or shaggier than their other parent breed, the Golden Retrievers. The coats come in a variety of colors too, from shades that vary from to dark brown to pearly white, with multiple colors thrown here and there. Owners need to carefully groom their goldendoodles to maintain the signature looks of their coats. Weekly brushing is important, while baths are only necessary if the coat gets dirty. The most common type of coat on goldendoodles is the wavy coat, also known as the shaggy coat. This coat occurs in the earliest goldendoodle generations as well as the later ones. The wavy coat is characterized by slightly longer hair that resembles a Retriever more than a poodle. The coat doesn’t curl, but is not as straight as a Retriever’s. The wavy coat is also the easiest to maintain. You only need to brush a wavy haired goldendoodle about once every week. But it’s best to brush around the ears, or under the collars, where the shagginess is higher, more frequently. This type of coat doesn’t usually shed, so it’s fairly simple to take care of. Remember, even wavy coats can get matted. Goldendoodles are highly active. 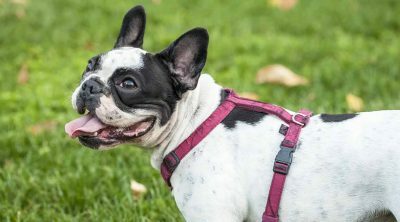 So your pooch is very likely to get itself dirty, requiring more brushing. 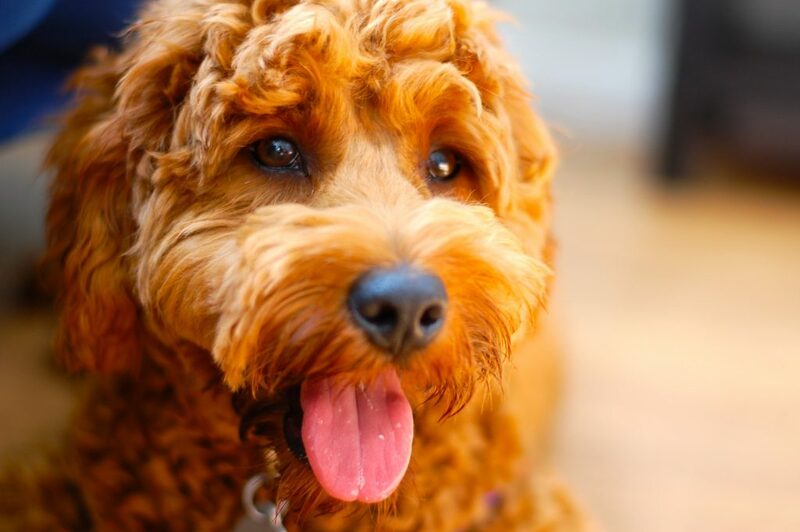 The curly coat is quite common in goldendoodles, and it’s the type that’s most likely to end up on Instagram. Curly goldendoodles have more poodle in them than Retriever. The curls can differ between individual dogs. Some have looser curls while others have tight, teddy bear curls. However, the curls don’t really resemble a poodle’s. Curly goldendoodles require frequent brushing. Brushing once or twice a week will prevent the curls from matting and getting too dirty. Even curly goldendoodles don’t shed a lot, so maintenance is not as rigorous as for other curly-haired dogs. Straight coats that resemble Retriever coats are uncommon in goldendoodles. In fact, straight coats are referred to by breeders as improper coats. There’s nothing actually physically wrong with this type of coat. It simply doesn’t make the goldendoodle look like the signature designer dog type. Straight goldendoodle coats require the least amount of brushing. Bit these coats can shed more than the other two types. You may need to brush your straight-haired goldendoodle several times a week if the shedding gets bad. You should consider your goldendoodle’s coat type as described above when buying a brush. Generally, the best brush for a goldendoodle is a slicker brush. 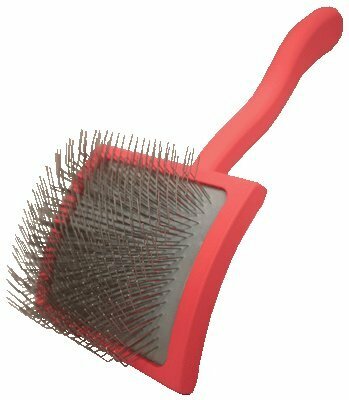 A slicker brush is a rectangular-shaped grooming tool distinguished by having really fine wire bristles. The bristles in a slicer brush are closely packed together. Also, each bristle stands out at an angle. As a result, these brushes are ideal for coat maintenance. A slicker brush can evenly distribute oil throughout a goldendoodle’s coat, keeping it as healthy as possible. Slicker brushes are also ideal for removing tangles and mats from fur, especially in curly haired goldendoodles. It’s adequate at removing dirt and grime. These brushes are very safe to use on goldendoodles. However, the pressure you apply matters. Pressing a slicker brush too hard on your dog’s skin might cause the bristles to scratch. Depending on the type of coat, another type of brush might suit your goldendoodle better. Bristle brushes are great for all skin types, whether curly, wavy, or straight. For slightly long fur, a wire pin brush might be more suitable. Always purchase the brush based on the type of coat your goldendoodle has. It’s better than buying a generic brush suited for the breed. There are many varieties of brushes on the market. So be ready to return a product if it doesn’t suit your needs. Don’t buy a brush with bristles narrowly packed together. It may cause your dog discomfort. And at last, check the type, not the price. The Hertzko slicker brush is made to remove matted hair, tangles, knots, dirt, grime, dander, and loose hair off a pet’s coat. 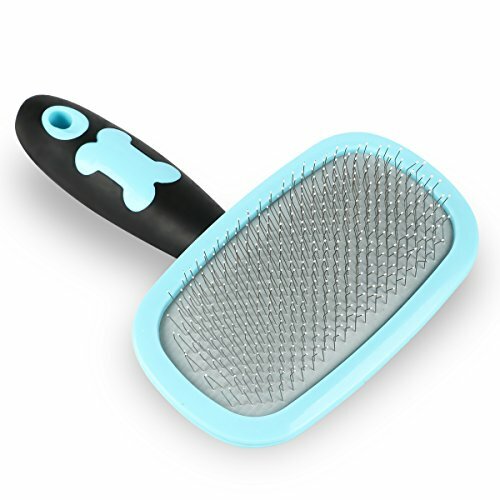 It’s designed to be a universal slicker brush suitable for both cats and dogs. But this might work better on goldendoodles with shaggier hair. The bristles are a bit long, so if your dog’s hair is too short, it might not like the feel of the bristles on skin. The bent bristles are made of fine wires and they really get inside the coat. It’s made from plastic and is very sturdy as a brush. No bending while in use. The brush as what the brand calls a “comfort grip,” which is a handle that is ergonomic to hold and doesn’t slip off. But the real prize-winning feature here is the easy to clean function. Anyone who’s ever owned a slicker brush knows the pain of getting all the fur out after a thorough brushing session. This comb has a neat mechanism where the bristles can retract, so the fur is really easy to remove. The brush has a small button to press to remove the hair. The feature doesn’t feel gimmicky and it’s something just about any pet owner can come to appreciate. On top of the cleaning simplicity, the brush comes with an affordable price tag that costs less than $20. The Furminator Deshedding Tool is one of the all-time popular brushes for dogs. 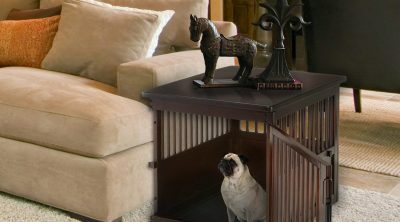 However, it’s designed for larger dogs weighing over 50 pounds. For small goldendoodles, the brand’s slicker brush is an option well worth considering. Furminator recommends this brush for long, medium, and curly coats on smaller sized dogs. This slicker brush has bristles on two sides. One side has straight bristles, while the bristles on the other side are bent at an angle. The pins are soft on one side and firm on the other. This allows for greater versatility when brushing your goldendoodle. This Furminator is designed to reduce pressure on the skin when brushing. Firm, pointy bristles can chafe against skin, making grooming sessions extremely uncomfortable for your dog. 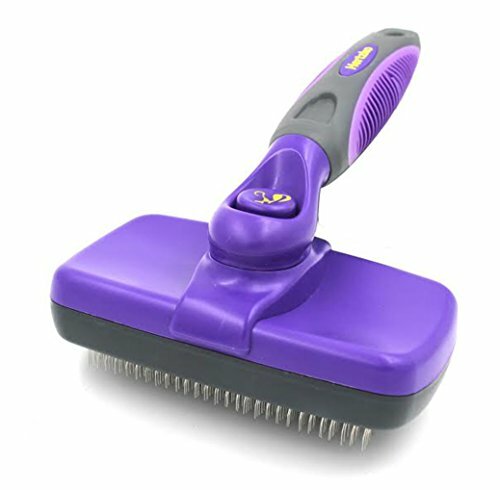 But this brush has what’s called a “dual flex” head design, which can bend to the contours of the dog’s body, so that the bristles don’t press down. The best use for this brush is for removing mats and detangling. It can get rid of knots without pulling or having to trim fur. The plastic brush is well made, too, with a comfortable handle for the owners. Furminator does make bold promises here, such as saying that the plastic of the brush is anti-microbial, which doesn’t make any sense. Unlike the famous DeShedder, this slicker brush doesn’t have the fur-ejector button for easy cleaning. However, the price tag is a lot less in comparison. Essentially, a no nonsense grooming comb made from steel. 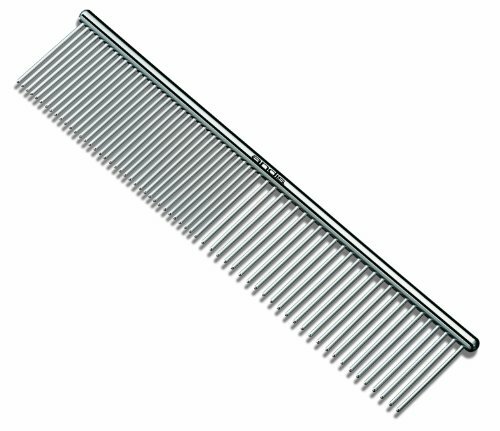 The comb is a one-piece of metal without a handle. Each tooth is about two inches long. The comb is 7.5 inches long overall. 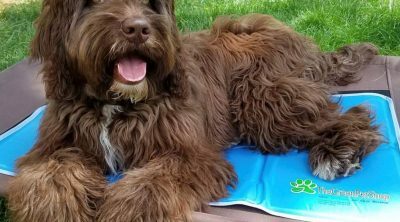 The product is just big enough to remove mats and loose hair from smaller dogs like goldendoodles. The comb is marketed as lightweight. Even If it doesn’t have a handle, it offers fatigue-free grooming. While this comb can very well get a dirty, matted coat clean for a bath, it might be best for finishing jobs. The coarse but fine steel teeth can fluff up shaggy hair, or add shine to teddy bear curls. This comb may not suit every owner. Cleaning can be a bit of a mess. You would have to manually remove all fur stuck to it. The steel, unlike plastic, is less likely to hold onto fur so it’s not a complete nightmare. 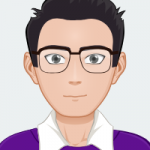 Overall, it’s a decent product that’s worth trying. It might be best suited for goldendoodles who don’t like slicker brushes. The pet “rake” is a unique style of brush that might suit straight haired goldendoodles the most. So the rake has two heads. One side has nine teeth that are set quite far apart. The other side has 17 teeth that are set close together, similar to bristles on slicker brushes. The 9-teeth side is for removing loose hair and mats from the coat. Because the teeth are far apart, it would not pull on the skin. The experience would be quite comfortable for the dog. When the mats are out, you can use the slicker-brush side to remove undercoat and dirt off the coats. Also, this doesn’t brush like the regular pet brushes. The rakes really rolls on the dog’s fur, imitating an actual raking function. 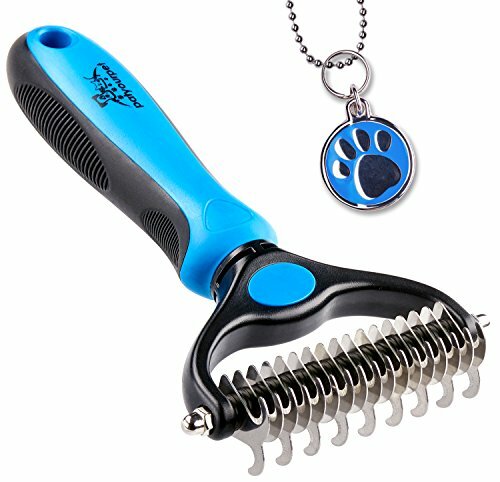 The grooming tool is designed with comfort in mind for the owner and the pet. The teeth have rounded edges, as to not hurt skin. Once you get used to this type of brush, it might work faster for you. The tools is slightly more expensive than slicker brushes. It’s not easy to clean, as the fur gets stuck in the teeth. Other than this, owners can try this on goldendoodles who really don’t like being brushed. This is an interesting slicker brush. It’s relatively small, about 6 inches in length and 4 inches in width. The handle is 3.7 inches long. Each brush pin in 0.4 inches long. The tool sis made from rubber and stainless steel. If you are looking for a gentle grooming slicker brush for your goldendoodle, this might be each. At the end of each bristle is a small metal ball. So the bristles don’t cut into the skin even when some pressure is applies. This brush might be ideal for older goldendoodles who cannot stand traditional clicker brushes feeling against skin. 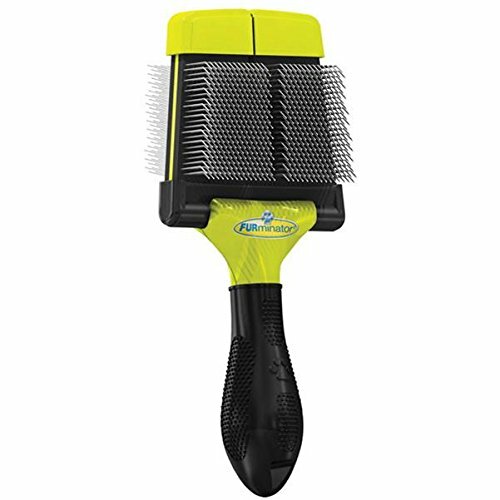 The slicker brush is suitable for both long and short haired dogs. The design is simple and easy to work with. The rubber handle has an anti-slip feature. 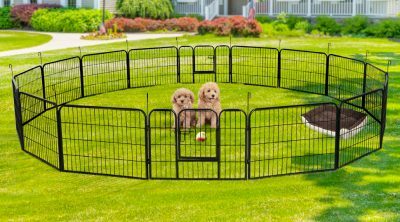 It won’t scratch your goldendoodle, but you still might want to use this with mild to moderate pressure. This is definitely one of the simpler slicker brushes out there. The design is straightforward, and you have to clean it all by hand removing each bristle of fur. The price under $10 is hard to beat. Most slicker brushes have bristles bent at an angle. This brush has fine pins that are pend at almost a 90-degree angle in the middle. The idea is to get the brush to remove thick undercoats. The pins can really get under the dense coats all the way down to the skin thanks to the unique angle. For goldendoodles with fluffy and shaggy hair, this brush might be the best bet for removing the second coat. The pinks are able to lift loose hair and dirt from the underneath for optimal removal. The pins won’t press down on skin directly, because of the angle. However, this brush relies a lot on using the right application techniques to avoid scratching and pulling. It probably won’t work with hyperactive pets. But there are some excellent comfort perks, like an extra-long handle that allows the user more control. The handle has a unique ergonomic design to reduce fatigue as well. This slicker brush almost feels like a designer version of the cheap ones you find online. Like a designer brush, it comes with a rather hefty price tag too. There are loads of truly excellent slicker brushes for goldendoodles out there. But the top prize definitely has to go to the Hertzko. The brush is affordable, flexible, and highly versatile. It can remove all sorts of undesirable things off your dog’s coat without hurting either you or the dog. The best part about the Hertzko slicker brush is the easy-to-clean pin retracting function. 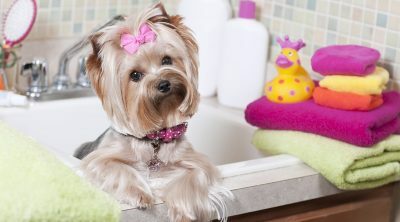 It would make any grooming sessions a breeze for pet owners. The Furminator slicker brush comes a close second. Both offer truly excellent features but the Hertzko has the edge in terms of functionality and ease. As there’s a lot of choice here, goldendoodle owners can try several products to see which brush your pet likes the most. 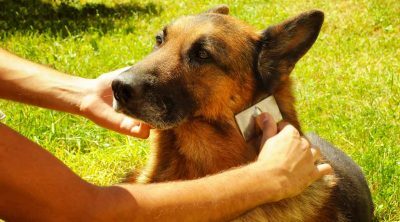 The right brush is essential for making grooming sessions bearable for the dog and the owner.